This Moroccan chermoula marinade gives lots of flavour to both fish and chicken. Chermoula is sometimes used as a dip too. However, this one contains turmeric, which should be cooked before eating. If you ever want to use it as a dip, substitute a good pinch of saffron for the turmeric. Note that the chicken needs to marinate for at least 6 hours, but preferably overnight. Cut the chicken into fairly even-sized chunks (about 2 cm/¾”) and put in a bowl. Put the remaining ingredients in a blender or food processor and blitz to make a paste. Mix well with the chicken and put in a glass or ceramic dish with a well-fitting cover. (Turmeric stains, so use plastic at your peril.) Refrigerate for at least 6 hours or overnight. You can cook the skewers in a stovetop grill pan or on the barbecue. If using a barbecue and bamboo skewers, soak the skewers for a few hours to delay charring. Thread the pieces of chicken onto 12 skewers. Place them in a hot stovetop grill pan or barbecue and cook until completely cooked through, turning as needed. Serve in a tortilla, Seasoned Roti Wrapper or Pocket Bread, with Salsa Fresca, Mango Salsa or Mango Chutney. 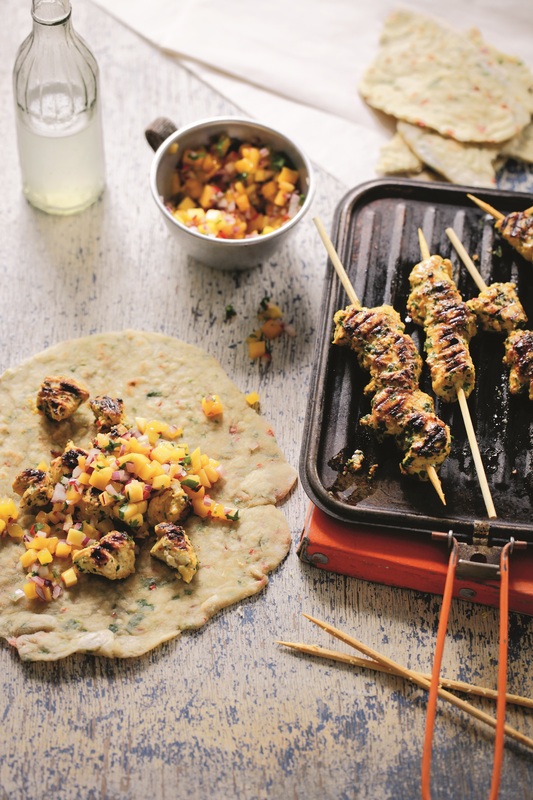 Our favourite combination is with Seasoned Roti Wrappers and Mango Salsa. Taken from Wrapped: crêpes, wraps and rolls you can make at home (Pavilion 2014)/Wrapped: crêpes, wraps and rolls from around the world (Interlink 2014). Photography by Keiko Oikawa.